I decided to pair this romper with a pair of wedges (again going for the whole comfort thing), and some simple jewelry. Oh and lets not forget my cutest accessory, my adorable Morkie, Novie! If you've been reading my blog for awhile you've heard me talk about him a few times and possibly seen a few pictures but I decided to include him in the fun today (he had a vet appointment yesterday so he wasn't too keen on staying home alone). He's a little camera shy and isn't usually a big fan of getting his picture taken so getting a few good pictures with him can be difficult! Ok so maybe it's more the lack of attention span but I'd say he did pretty good! I love this! I finally own my own romper (I've been nervous about them! ), and now I see why everyone loves them so much! So much comfort! You look gorgeous! That romper is so cute and fits you perfectly! And your puppy is beyond adorable, of course! Love the romper - and I totally giggled at your comment about the space in the stall getting wider - it's so true!! I just love how you can dress them up or down with shoes alone!! Great buy doll! 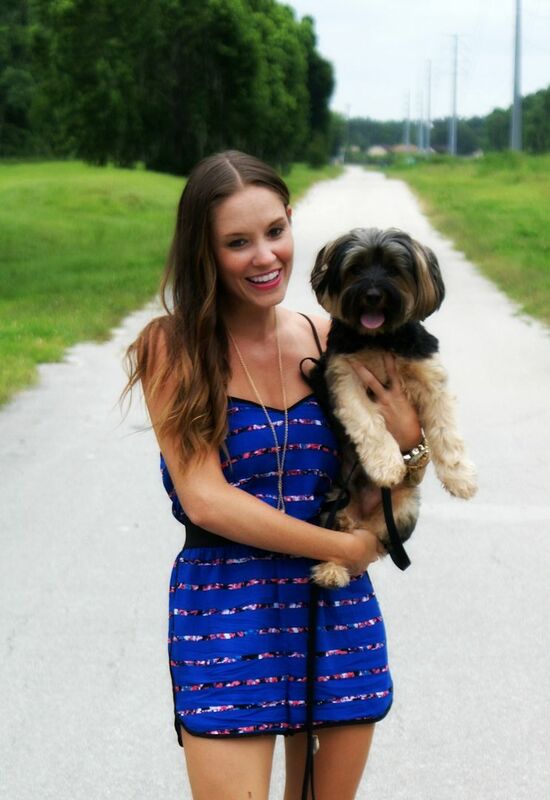 Love the romper and love your pup too of course-so adorable! oh my gosh how cute!! florals and stripes combined? let me at it. You are absolutely stunning! And I love your doggie! OMG CUTE PUPPY! Such a fun look too, love that dress! Glad youre becoming obsessed with rompers too! Sorry Nov totally stole the show! Haha jk! Love it! I am totally obsessed with that romper! I love the little details! What a great find! And a Morkie!? I need one! What is the "Mo" part mixed with the Yorkie? He's the perfect accessory! I am dying - the bathroom thing never occurred to me while wearing a romper. Ha! You look great, and your dog?! He's a doll! Love that romper on you! And your dog! I love the name Novie! I LOVE this romper! I saw it at Target this past weekend and they were out of my size :-( Looks fabulous on you! Adore this romper and your fur baby is TOO CUTE!! What a cute baby! He looks so huggable! And of course, you look great in that romper! romper looks cute on you but damn if i think i don't look like a fat cow in one. JUST saying :) also the whole getting naked part is another deterant. we had a discussion about this in vegas last time i was there and it was decided that for as many of them as we saw there, we couldn't see how you could wear one without feeling gross in the public restrooms there ha. Novie is PRECIOUS!!! I want him :) What a cute romper, still haven't bought one. I did look at some at Nordstrom Rack last week, but they were pant ones. That's funny, because we had a whole conversation about how awkward it must be when you have to go to the bathroom haha. That is such a cute romper, I'm definitely scooping that up if I see it at my Target! Annnd your dog...so so so cute!! I love rompers because it's one piece and you're out the door. Plus, they look so comfy and cute! Love your wedges and your dog is too adorable for words! Looks perfect on you!! Love th royal blue color, it really pops!! I've never worn a romper for the whole fear of having to use the bathroom! Lol! eeee love love love! Geez you lookin' fab girl!! Novie is too cute first of all. :) Sweet babe. I am obsessed with rompers too! It's like as soon as I see something is a romper and not a dress, it becomes instantly irresistible to me. Cute one! Looks great on you! I had that romper in my cart today and put it back and now I am regretting it agh!!! your dress is so cute!!! and your dog is adorable, my little chihuahua Lupi is very camera shy too so is very hard to include her in my posts, but I try so hard every time! lol Thanks for your lovely comment on my blog, I'm following you on Bloglovin and Facebook. What a lovely outfit! And your dog! <3 soo cute!